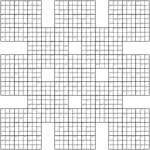 This entry was posted by Gareth Moore on May 7, 2009, and is filed under Killer Sudoku, Killer Sudoku Variants, Samurai, Samurai Variants, Sudoku, Sudoku Variants, Toroidal. Follow any responses to this post through RSS 2.0. You can leave a response or trackback from your own site. Well, that was a marathon, but I finally got this one completed! As you said, not TOO difficult, but still quite time consuming. I didn’t time myself but it was definitely over the two hours. I really enjoy these large puzzles. I’m very impressed! I didn’t think anyone would actually complete the entire thing! Did you print it out over several pages and stick them together, or do you have a giant printer? I printed it out on normal A4 paper but enlarged it at work onto A3. That and a good pair of reading glasses did the trick!!! I printed this thing out on normal 8.5×11 paper and completed it in a whole bunch of hours. I didn’t time myself either, but it was certainly more than two hours for me too! I love these big puzzles as well, and this one was certainly no exception. It wasn’t too hard to figure out once I got going and learned the common multipliers and such. Just took forever, as mentioned. Got it. I was listening to podcasts while working on it and had to stop a couple of times because I was getting headaches from the print being small on A4. Same problem with the Samurais in the local papers. They make them tiny in print to save space so I have to blow them up in a paint program and print them out, otherwise I feel like I am making mistakes from the squares being so small.